Princess broke new ground when they launched the Princess 50 which has long been the benchmark for her class. Impeccable handling, blistering performance and exceptional space and comfort the model quickly became something of an iconic product for the Plymouth boat builder. So to replace this model is no small feat but the new Princess 52 promises to be a craft that is definitely up to the challenge. WSB takes a closer look at 52 and checks out if the credentials measure up. As with all Princess models, the new 52 has been designed and engineered by one of the largest and most experienced in-house development teams in the industry and created using some of the most advanced technology available in the marine industry today. Her unique hull is the latest design of the legendary Princess deep-V hull, with a variable geometry deadrise aft of the point of entry to provide a smoother transition to plane and widen the range of planing speeds to improve efficiency, particularly when cruising. 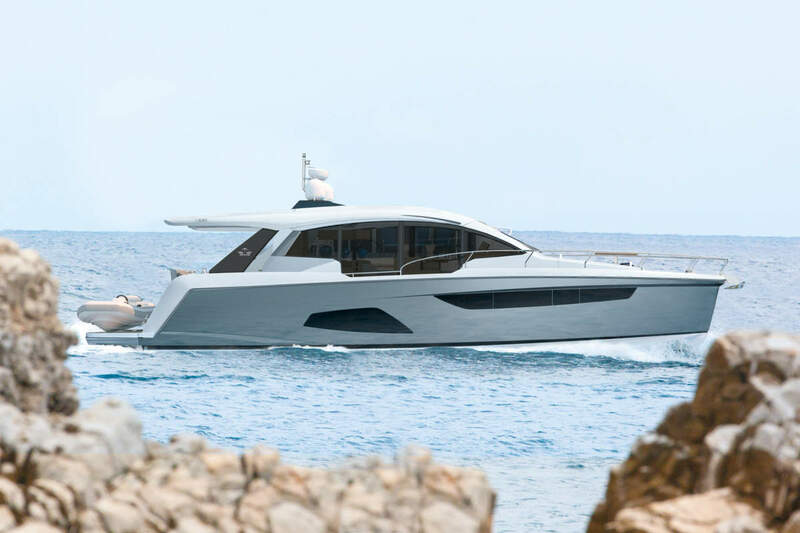 The hull is also resin-infused to reduce weight and increase torsional stiffness, significantly improving performance with less power making her one of the most efficient yachts of her class. Out on deck the spacious cockpit is fitted with a large teak dining table and generous seating providing the perfect place to relax in the shade offered by the extended flybridge above. A second alfresco dining table is situated on the flybridge which, with extensive seating, convertible sunbed and optional wetbar, is ideal for entertaining. Wide side decks and teak-laid steps ensure safe movement around the boat and an optional hydraulic raise/lower mechanism transforms the bathing platform into a submersible beach or operates as a simple and effective launch and recovery system for a tender. As you would expect from a Princess, the attention to detail and quality of finish throughout her interior is of the highest standard. Large windows fill the main deck with natural light and ensure wonderful views and excellent visibility for the lower helm. The galley is situated aft of the saloon creating a highly sociable atmosphere whether entertaining guests in the cockpit or around the large dining table inside. The extra space created by positioning the galley on the main deck allows for three very spacious and beautifully appointed cabins below. The master stateroom is situated aft to make use of the full beam and features large hull windows either side to create an exceptionally light space and provide wonderful views. Both the master and the spacious forward guest cabin have generous en-suites and ample storage throughout. The optional aft cabin, with its own WC, incorporates a single bed for crew or occasional guests. The new Princess 52 is one of a long line of successful Princess flybridge models that have benefitted from five decades of experience and expertise in building some of the worlds finest motor yachts. Created by some of the most passionate designers, engineers and artisans Princess yachts don’t meet standards, they set new ones and the new Princess 52 is no exception. With her contemporary design, exceptional quality and exhilarating performance she is sure to continue this tradition and keep Princess leading the way.